Zhenhui is our exclusive brand and we specilaize in fashion jewelry.We aim to provide our customer with high quality products and better service. 1.SIZE: Necklace Chain Length-15.70” Necklace Extension Chain-3.00” Necklace; Ring Width-1.75” Ring Hight-1.75”; Earrings Height-1.00” Earrings Width-0.60” | 2.WEGHT: Necklace Weight-140 gram; Ring Weight-20 gram; Earring Weight-6 gram | 3.PACKAGE INCLUDED: 3 pieces set including 1 necklace, 1 pair of earrings and 1 ring. Pretty design, nice construction and eye-catching; Made of clear transparent Austrian crystals and Eco-friendly antique gold plated alloy. More than 500 pieces of sparkly crystal rhinestone are assembled by hand. Awesome construction and it lays beautifully on the neck. A combination of such various colors brings shining and eye-catching effect. The vintage flower statement jewelry set is suitable for you to attend special occasions, such as dinner party, birthday party and wedding. The colors on the necklace could go with any outfit you choose. You will surely get tons of compliments on multiple occasions. PACKAGE INCLUDED: 3 pieces set including 1 necklace, 1 pair of earrings and 1 ring. 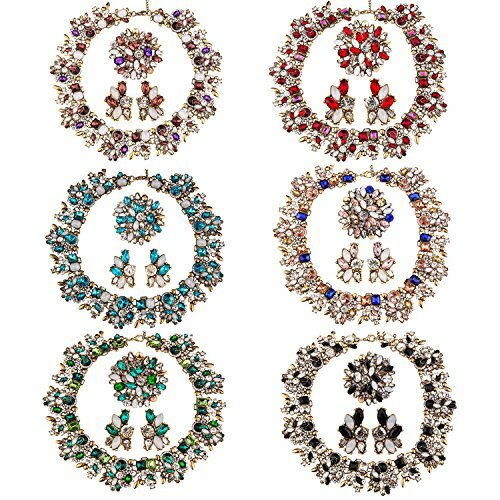 OCCASIONS: The vintage flower statement jewelry set is suitable for you to attend special occasions, such as dinner party, birthday party and wedding. BEST GIFT OPTION: Comes with a free luxury jewelry box.Can make a great gift. This set is an ideal gift for your loved ones, e.g. Lover, girlfriend, fianc¨¦e, wife, mother, couple, Valentine or just a friend, etc. Elegant and exquisitely made bridal jewelry set. It is also a good choice for engagement or wedding jewelry, which is endowed with special significance.